The Atlanta Journal and Constitution newspaper estimates that only half of the Jewish “Holocaust survivors” around the world in 1985 had received restitution under the BEG. If this 50% estimate is accurate, it would mean that approximately 5.8 million European Jews survived German persecution during World War II. Such a large number of surviving Jews is not consistent with a German program of genocide against European Jewry. Did 6 Million Jews Die in World War II? The allegation that 6 million Jews died in World War II is today widely considered to be an established historical fact. For example, the Encyclopedia Judaica states, “There can be no doubt as to the estimated figure of some 6 million victims.” The U.S. Holocaust Museum in Washington, D.C. is described in its information sheet as a “living memorial to the 6 million Jews and millions of other victims of Nazi fanaticism who perished in the Holocaust.” However, an analysis of the 6 million Jewish wartime deaths shows that this figure is not the result of any careful investigation, research or calculation. The 6 million figure of Jewish deaths had been used and predicted long before the end of World War II. An ancient Jewish prophecy had promised the Jews their return to the Promised Land after a loss of 6 million of their people. According to the book Breaking the Spell by Nicholas Kollerstrom, publications and speakers had referred to the death or persecution of 6 million Jews on at least 166 occasions before the end of World War II. While there are in Russia and Rumania 6 millions of Jews who are being systematically degraded…” An article in the March 25, 1906 edition of the New York Times worried about the “condition and future of Russia’s 6 million Jews…” The article further states “…the Russian Government’s studied policy for the ‘solution’ of the Jewish question is systematic and murderous extermination.” Max Nordau, cofounder of the World Zionist Organization, warned in 1911 of the “annihilation of 6 million people” at the Zionist Congress in Basel, Switzerland. Glynn’s article was printed on October 31, 1919. The allegation was the “threatened holocaust of human life” was occurring after the Great War. The Chicago Tribune on July 20, 1921 published an article headlined: “Begs America Save 6,000,000 in Russia.” This article claimed that “Russia’s 6 million Jews are facing extermination by massacre. As the famine is spreading, the counter-revolutionary movement is gaining and the Soviet’s control is waning.” The United Jewish Campaign of New York in 1926 set a fundraising goal of $6,000,000 to help the “dying” Jews of Europe. On December 29, 1931 a Montreal newspaper ran a baseless claim from Rabbi Stephen Wise that 6 million Jews faced starvation in southeastern Europe. 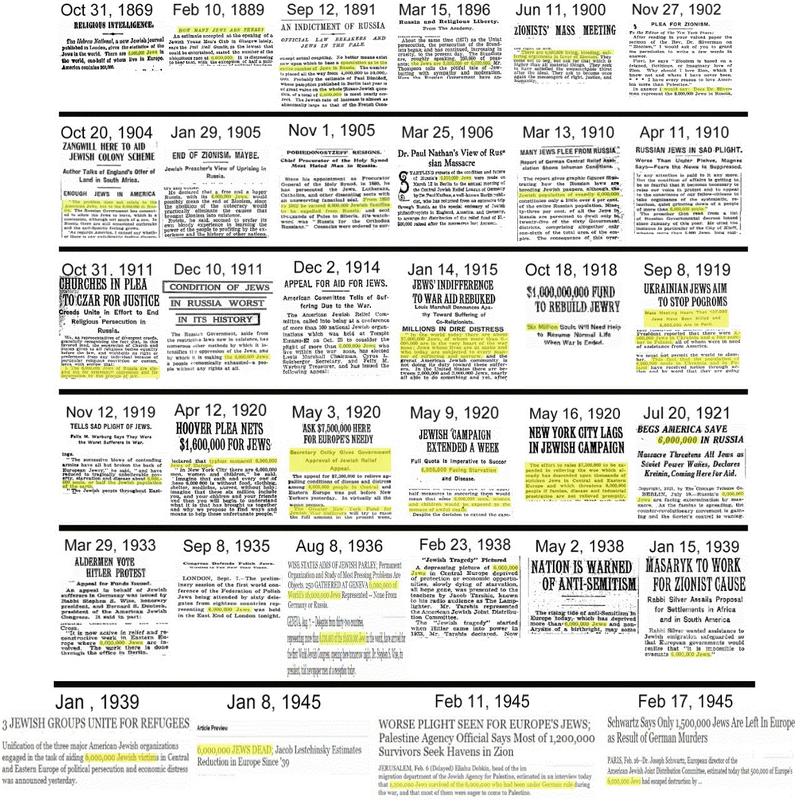 On January 9, 1938, the New York Times reported another false claim of 6 million Jewish victims of persecution. In an article appearing in the June 25, 1940 issue of the Palm Beach Post, Dr. Nahum Goldmann, who was the administrative committee chairman of the World Jewish Congress, said “if the Nazis should achieve final victory 6 million Jews in Europe are doomed to destruction.” Not a single Jew had been interned and Hitler was still pleading for peace. Yet the so-called Holocaust and the 6 million Jews doomed to destruction was already established. The number of 6 million appeared again on January 4, 1945, when the Jewish chief of Soviet atrocity propaganda, Ilya Ehrenburg, stated that this is the number of Jews that had died in World War II. On January 8, 1945, the New York Timespublished an article in which Jacob Lestchinsky, a Communist correspondent for the New York Jewish Daily Forward, estimated that the Jewish population in Europe had been reduced from 9,500,000 in 1939 to 3,500,000. Lestchinsky stated: “Of the 6 million European Jews who have died, 5 million had lived in the countries under Hitler’s occupation.” How Ehrenburg and Lestchinsky came up with their numbers fully four months before the end of the war is anyone’s guess. 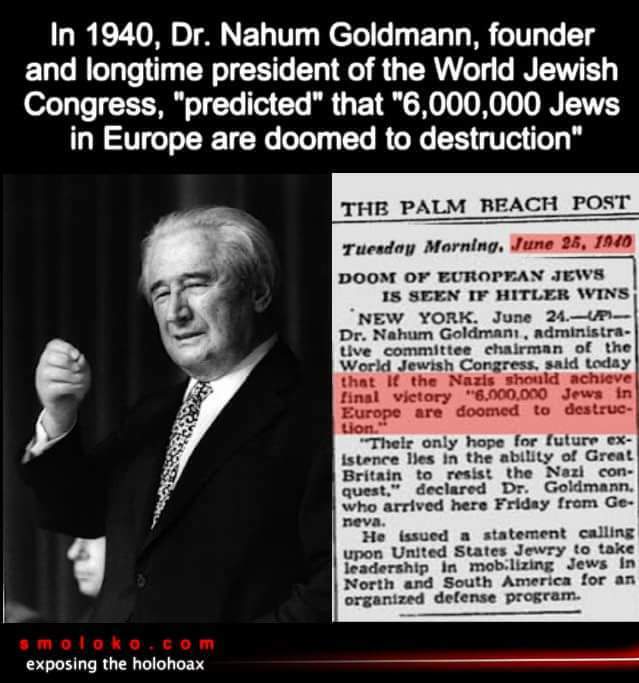 Immediately after the end of the war in Europe, an article in the Pittsburg Press on May 13, 1945, headlined “Nazis Destroy 6 Million Jews.” In June 1945, some Zionist leaders were also able to state that 6 million Jews had died during the war. These Zionist leaders made this statement even though the chaos in Europe at the time made any definitive demographic studies impossible. The figure of 6 million Jews who died in World War II reappeared at the International Military Tribunal (IMT) in Nuremberg. The number of 6 million used at the IMT is based primarily on the hearsay evidence given by the written deposition of German SS-bureaucrat Wilhelm Höttl. The verbal but never cross-examined testimony of Dieter Wisliceny, who said that 5 million Jews had died during the war, is also used to substantiate the figure of 6 million. These two men claimed that they heard these statements from Adolf Eichmann, but Eichmann later disputed that he ever made these statements. Thus, the prosecution’s claim at the IMT that 6 million Jews died in World War II is based solely on hearsay evidence from two German SS-bureaucrats seeking exemption from punishment whose only source later said that he never made the statement. As of January 1984, there were 4.39 million successful individual restitution claims under the terms of the German Federal Compensation Law (BEG) of 1953 and 1956. This law provides monetary compensation to individuals who were “persecuted for political, racial, religious or ideological reasons” by the wartime German government. The great majority of these successful restitution claims were from Jews. Raul Hilberg estimates that about two thirds of the allowed claims had been from Jews. Using Hilberg’s conservative estimate would mean that over 2.9 million Jews had received BEG restitution claims by January 1984. The number of 2.9 million Jewish claimants understates the number of Jews who survived World War II because as of 1985 Jews in Poland, the Soviet Union, Hungary, Romania and Czechoslovakia were not eligible for BEG restitution. Also, some European Jews who survived World War II died before the German BEG restitution law was enacted in 1953. The Atlanta Journal and Constitution newspaper estimates that only half of the Jewish “Holocaust survivors” around the world in 1985 had received restitution under the BEG. If this 50% estimate is accurate, it would mean that approximately 5.8 million European Jews survived German persecution during World War II. Such a large number of surviving Jews is not consistent with a German program of genocide against European Jewry. The Holocaust story also originally claimed that about 4 million Jews died at Auschwitz-Birkenau. As late as 1988, on page 19 of the official Auschwitz State Museum Guidebook, the official figure of 4 million Jews killed at Auschwitz-Birkenau is affirmed. The 4 million Jews who perished at Auschwitz-Birkenau had also been used by the Soviet State Extraordinary Commission for the Investigation of Nazi Crimes, the Supreme National Tribunal in Poland, and the IMT in Nuremberg. The estimate of 4 million Jews who died at Auschwitz-Birkenau was based on the evidence of hundreds of surviving prisoners and the opinion of experts. Scholars such as Israeli Holocaust expert Yehuda Bauer and Dr. Franciszek Piper decided around 1989 to lower the Auschwitz-Birkenau death count. Dr. Piper states in his book Auschwitz: How Many Perished, “Altogether, a total of about 1,100,000 Jews ended up in Auschwitz-Birkenau in the years 1940-1945.” The number of approximately 1 million Jews who died at Auschwitz-Birkenau is most often used as the official figure today, although some researchers such as Jean-Claude Pressac use much lower estimates. By dramatically lowering the figures, the camp curators were in effect admitting that the Communists and other officials had fabricated numbers that were too inflated to be believable. The 4 million Jewish deaths at Auschwitz-Birkenau had to be lowered to approximately 1 million in order to maintain the credibility of the Holocaust story. Since the figure of 6 million Jews who died in German camps is based on the 4 million Jews who died at Auschwitz-Birkenau, one would think that the 6 million Jewish deaths in the German camps should be lowered to about 3 million. However, the official number of Jews dying in German concentration camps remains at 6 million even though this is now obviously an overstated number. The book The Dissolution of Eastern European Jewry by Walter Sanning is probably the most scholarly study ever written of 20th century Jewish demography, especially in its analysis of World War II related Jewish population changes. Sanning bases his study almost exclusively on Allied, Zionist, and pro-Zionist West German sources. His analysis includes evidence given by the wartime U.S. Assistant Secretary of State, the Institute of Jewish Affairs, the American Jewish Year Book, official census publications, and the pro-Zionist Institute for Contemporary History in Munich. Sanning keeps his book as free of emotion as possible in order to contribute to a genuine discussion underlying the charge of German genocide. While it would be impossible for anyone to give an exact number of Jews who died in the German camps during World War II, The Dissolution of Eastern European Jewry proves that not anywhere close to 6 million Jews died during the war. Sanning calculates that the worldwide losses suffered by Jews during the Second World War are in the neighborhood of 1¼ million. He estimates that 15,967,000 Jews were alive in 1941 before the German invasion of the Soviet Union, and that the Jewish population was reduced to approximately 14,730,000 after the war. According to Sanning’s analysis, more Jews died in Soviet camps than died in German camps during the Second World War. – Holocaust Eyewitnesses: Is The Testimony Reliable? Blech, Benjamin, The Secret of Hebrew Words, Northvale, NJ: Jason Aronson, 1991, p. 214. Kollerstrom, Nicholas, Breaking the Spell: The Holocaust, Myth and Reality, Uckfield, UK, Castle Hill Publishers, 2014, pp. 158-174. Bradberry, Benton L., The Myth of German Villainy, Bloomington, IN: AuthorHouse, 2012, p. 198. King, M. S., The Bad War: The Truth Never Taught About World War 2, 2015, p. 42. 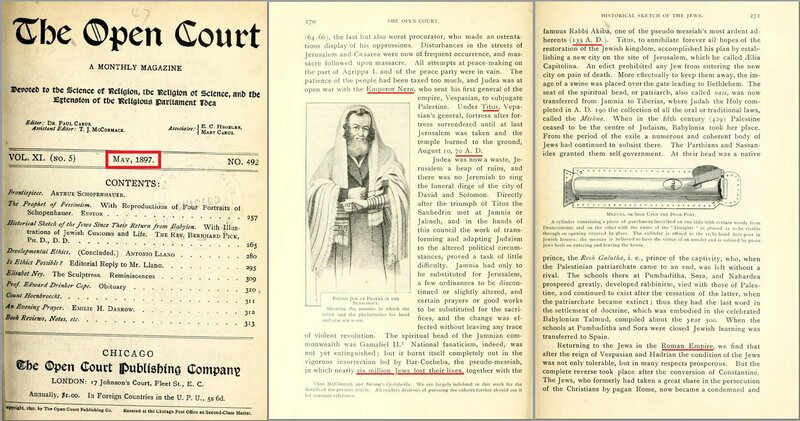 “The Crucifixion of the Jews Must Stop,” The American Hebrew, Vol. 105, No. 22, New York, Oct. 31, 1919, p. 582. King, M. S., The Bad War: The Truth Never Taught About World War 2, 2015, pp. 69, 83, 203. Bradberry, Benton L., The Myth of German Villainy, Bloomington, IN: AuthorHouse, 2012, p. 199. Rudolf, Germar, “Holocaust Victims: A Statistical Analysis,” in Gauss, Ernst (ed. ), Dissecting the Holocaust: The Growing Critique of Truth and Memory, Capshaw, AL: Thesis and Dissertations Press, 2000, p. 184. King, M. S., The Bad War: The Truth Never Taught About World War 2, 2015, p. 112. Hoffmann, Joachim, Stalins Vernichtungskrieg 1941-1945, Munich: Herbig, 1999, pp. 390-393, and in Hoffman, Joachim, Stalin’s War of Extermination 1941-1945, Capshaw, AL: Thesis and Dissertations Press, 2001, pp. 189-190, 402-405. King, M. S., The Bad War: The Truth Never Taught About World War 2, 2015, p. 202. Irving, David, Nuremberg: The Last Battle, London: Focal Point, 1996, pp. 61-62. Rudolf, Germar, “Holocaust Victims: A Statistical Analysis W. Benz and W. N. Sanning—A Comparison,” in Gauss, Ernst (ed. ), Dissecting the Holocaust: The Growing Critique of Truth and Memory, Capshaw, AL: Thesis and Dissertations Press, 2000, p. 183. Turly, Mark, Inconvenient History, Vol. 1, No. 3, Winter 2009; see also Taylor, Telford, The Anatomy of the Nuremberg Trials: A Personal Memoir, New York: Alfred A. Knopf, 1992, p. 248. Aschenauer, Rudolf (ed. ), Ich, Adolf Eichmann, Leoni, Bavaria: Druffel, 1980, pp. 460-461, 473-474, 494.
 International Military Tribunal, Trial of the Major War Criminals Before the International Military Tribunal, 42 Vols. Nuremberg: 1947-1949. (The “blue series”) / IMT, Vol. 19, p. 434. Stephen Pinter letter in the national Catholic weekly, Our Sunday Visitor, June 14, 1959, p. 15. Stäglich, Wilhelm, Auschwitz: A Judge Looks at the Evidence, Institute for Historical Review, 1990, p. 31. Interview with Norman Finkelstein, by Viktor Frölke, in Salon.com, “Shoah business,” Aug. 30, 2000. See also Finkelstein, Norman, The Holocaust Industry, New York: Verso, 2000, p. 81. Hilberg testimony in Zündel case, Toronto District Court, Jan. 18, 1985. Transcript p. 1229. Atlanta Journal and Constitution, Sunday, March 31, 1985, p. 15A. See also Weber, Mark, “Wilhelm Höttl and the Elusive ‘Six Million’,” The Journal of Historical Review, Vol. 20, No. 5/6, Sept./Dec. 2001, pp. 29-30. Piper, Franciszek, Auschwitz: How Many Perished, Krakow, 1994, p. 37. Duke, David, Jewish Supremacism: My Awakening to the Jewish Question, 2ndedition, Mandeville, LA: Free Speech Press, 2007, p. 287. Sanning, Walter N., The Dissolution of Eastern European Jewry, Costa Mesa, CA: Institute for Historical Review, 1990, p. 198. Reitlinger, Gerald, The Final Solution, New York: A. S. Barnes & Company, Inc., 1961, p. 499. This Six Million figure must have some talismanic or cabbalistic significance to the Jews. Holocaust arithmetic never adds up. If you took the high end numbers for all these death camps (6 in Poland) and added the open field killings of the Einsatzgruppen on the Eastern Front, you arrive at a total of between 16 and 17 millions killed. These sensationalist exaggerations lead one to question the veracity or lack thereof of the whole story. Compilation of 154 German cities bombed in WW2.